We’re happy to announce our newest Pulse Isolation Relay device, the SPR-110. The SPR-110 is a specialized pulse isolation relay that features one Form A (2-wire) or Form C (3-Wire) input and TEN Form C solid state dry-contact outputs. Used in applications where up to ten receiving devices need the same pulse input, the SPR-110 provides the greatest number of outputs available in the industry. Other applications would include testing systems where a number of devices need a pulse input. By combining ten outputs into one device drive by one pulse input, the SPR-100 eliminates multiple devices having fewer outputs and a tremendous amount of wiring to come up with the same equivalent metering scheme, and provides an easy and convenient solution when a large number of pulse outputs are needed. Chassis mounted for mounting in another metering enclosure or SSI’s optional 10” x 8” X 4” NEMA 4X fiberglass enclosure. The SPR-110’s outputs are selectable in one of two modes, Toggle mode to emulate standard KYZ pulse 3-Wire Form C metering or Momentary mode to emulate 2-Wire Form A metering configurations. Each output has its own individual standard 3AG or AGC 1-1/4” x ¼” fuse for easy replacement if needed. The SPR-110 is mounted on a 9” x 7” aluminum mounting plate with key-hole mounting slots, making it easy to mount the unit inside another enclosure. Additional mounting holes are provided in each corner of the mounting plate for standard 10” x 8” NEMA enclosures. 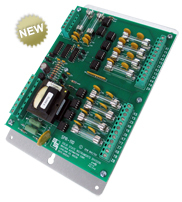 The board is mounted approximately 1/2” above the mounting plate surface providing excellence isolation from ground. The SPR-110 is available in also available in optional indoor (NEMA 1) steel or outdoor (NEMA 4X) fiberglass enclosures.